Yachting during the 1920s was a glorious and very significant part of American history. It was a time of incredible fortunes and magnificent yachts, a time when high society was the closest thing there was to royalty in America. Such fortunes would diminish in size and number with the introduction of personal income tax in 1917, and the evolution of yachting would wane from larger and faster to smaller and more affordable. 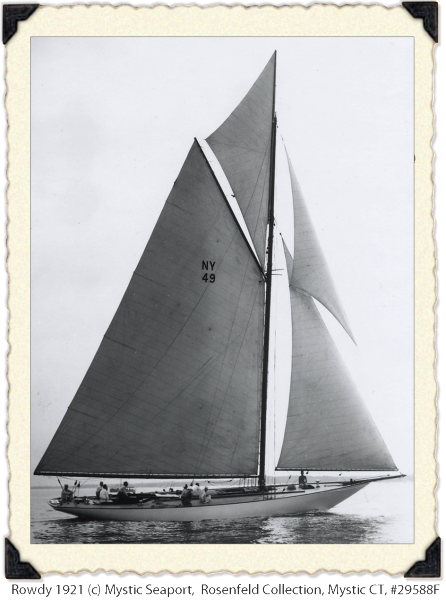 In 1905, Nathanael Herreshoff designed and built eighteen of the one -design class New York 30s for some of the most prominent members of the New York Yacht Club. In 1913, he built and designed nine of the New York 50s. Measuring 70’ on deck, this was the largest class of sizeable one-design boats the world had ever seen. In 1916, he filled the gap between the two, and designed and built twelve of the one -design class New York 40s. (Two more were built in 1926.) The New York 30s, 40s and 50s symbolize the peak of the golden age of yachting. The American Public was enamored with these large yachts, and spectators frequently came out by the hundreds to watch them battle it out for trophies. The New York 40s (so named because they were built for the New York Yacht Club, and because they measured 40′ at the water line) were 59′ on deck with an additional 6′ of bow sprit, 14’3″ beam and 8′ draft. The 40s were designed to be cruisers with gracious accommodations, and racing was expected to be a secondary consideration. They turned out to be the “hottest racing class of their time called the Fighting Forties because they raced hard all day, and the Roaring Forties for drinking hard all night”(History of the New York Yacht Club, Parkinson, 1975). “People have said that only Herreshoff could have developed such speed in a boat as wide and roomy as the New York 40, and certainly this has not been done since” (Rudder Magazine 1951). ” The New York 30s, 40s and 50s have never been bettered for all around sailing excitement and pleasure” (Herreshoff of Bristol, Maynard Bray & Carlton Pinero, 1989). 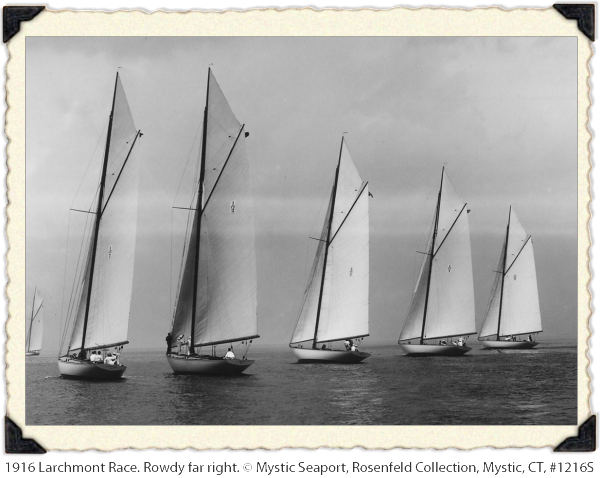 “After the war there was great racing in this class, considered a baby of the New York Yacht Club fleet”(Seawanhaka Yacht Club1897-1940, Parkinson, 1965). Holland Sackett Duell placed his order for Rowdy on October 14, 1915 for $10,000 plus $280 for the wheel option instead of a tiller. He took possession and began racing in early May 1916. Her sail was alternatively NY49 or NY9. Holland owned her for almost 25 years (the longest original ownership of any of the New York 40s) and, to this day, Rowdy is the only New York 40 to have never had her name changed. In 2006, after a complete rebuild by Chris Madsen (1998-2004) Rowdy was purchased by Graham Walker who relocated her to the Mediterranean. Under his ownership Rowdy has again become a world class champion, winning in excess of 140 races. Vixen II(ex-Jessica) (1916) Wood hull has been replaced with ferro cement. Greatly altered from original. As of 2009 She was in the Mediterranean. Wizard of Bristol (ex-Dolle Bowen) (1916) Hawaii. Rugosa II (1926) Actively racing and cruising. Katharine was destroyed in Jacobson boatyard in Oyster Bay. Her yawl rigged spars are now on Rugosa II. Squaw was purchased by Mr. McNeil of Southport, CT in 1953 from Mr. Chubb of Chubb Insurance in New York. Mr. McNeil renamed her Blue Smoke and sold her in 1968. She sank in 1970 off the entrance to Nassau harbor. Shawara sank in 1933 off Cape May, New Jersey. Returning home from the Gibson Island race, Shawara encountered a gale and took on water faster than her crew could bail. The crew of seven was picked up by the Standard Oil tanker Yorba Linda. Pamparo. Mark Andrews wrote to me his great Charles Lee Andrews, a specialist on the floor of the NY stock exchange, bought Pamparo in the twenties for his son Richard Snowden Andrews. He believes that the boat was broken up for lead during WWII.